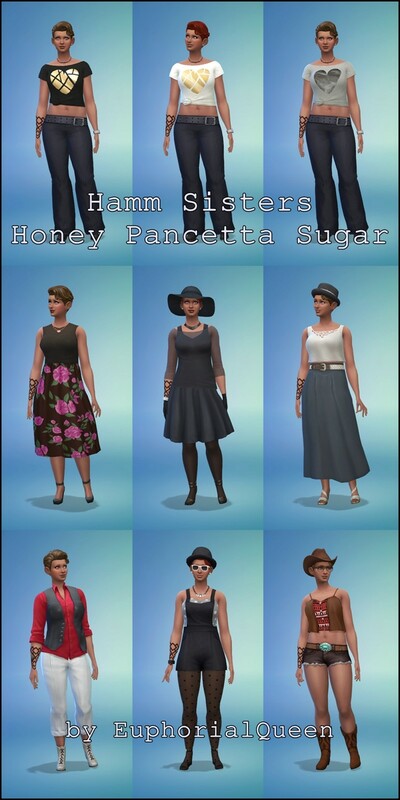 Has anyone played the Three Little Sims Challenge in Sims 4? Would anyone be interested in a revised version? 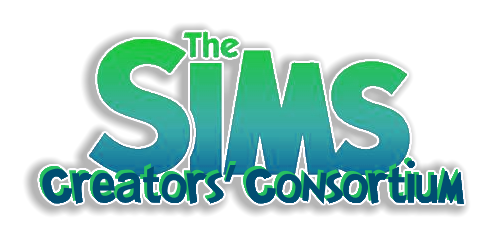 EDIT: As of February 2017, I'm logging back onto this forum for the first time in over six months, as I haven't been active on it, or been playing sims much at all anymore (I still love it; I'm just a very casual simmer now as I don't have much time to play and have just lost interest). Because of this, I'm going to officially abandon this challenge as it is. SO, if anybody would like to take this and run with it, like adding updates for game updates or expansion packs and just generally do better than I have, feel free to! (Just make sure you credit me and Addict1220 ) Happy Simming! Just read through a few of the comments, each sim is to use their own amenities in their own homes? Such as: they can't go to the "neighbors" house and use their toilet when they have one of their own. If you aren't in control of that sim on that day, the only way I can see keeping that from happening is to make sure the doors are locked to everyone except the sim that is living in that home. Yes that is true. Some of the rules are not quite up to date. I just set up a test run of my own to see what could be modified to make it a bit better. I think this looks interesting. I skimmed over the thread on the sims forums. I think the only way to keep track of money is to maybe write down what a sim has made at the end of each day you play them. That way you could keep it separate. Doing so would make it fun when build out each house. If you made it where they could only use their own money on their own little house. I would be willing to do it that way since I play the game with a notebook handy anyway, but not sure if others would want to have to keep a record. I was wondering about that part too, I do keep a notepad handy but have found that more often than not, if I get busy into what my sim is doing I forget to write things down. I would have a difficult time keeping track of each individuals earnings. 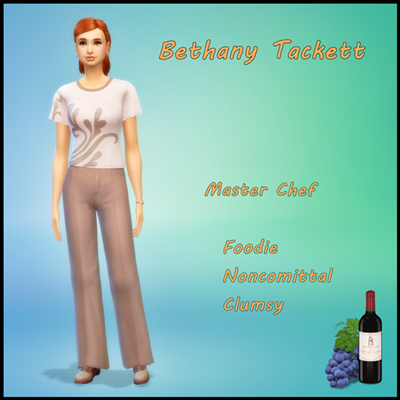 @EuphorialQueen, I too will find it more of a challenge for myself as far as not being in control of the two other sims! I fear my husband is going to hear a lot of, "What are you doing?!" "Seriously? You couldn't take yourself to the toilet?" "Um it's called a stove and refrigerator...go EAT!" "Dude...you stink!" "What the heck?" "Whaaaaa????" "OH NO YOU DIDN'T!" "Oh...my...God....no words." "Why am I doing this to myself? Anyone?" "This is just pure torture of the worst kind...." "If you don't clean up after yourself, I'm taking the doors away when you do manage to find your bed!" "Hey, you! That IS NOT your house!" "Three words...Go...To...WORK!" "Okay fine! Have it your way! Go ahead live in a pig style see if I care!" "You three are pathetic. Bunch of lazy butts anyway." "Wow...just....wow." "Ughhhhh." Yes, on further thinking about the money thing, it would become a bit too much to handle after a bit. And I could see myself forgetting to do it on days I am not feeling 100%. I was going to try this out some this afternoon. Maybe you could do something like they can only spend what they make during that day you play them I like the idea of a communal eating area and shower room. lol. Moving 3 sims onto a lot and trying to build a home for each with the starting funds will be a big challenge in itself. I started a save with 3 YA sims, after buying the lot, I put them in Oasis Springs on the largest empty lot there and built 3 medium/large type boxes for their homes, put in an entry door for each, added a room for the bathroom in each, put in a fridge, stove, couple counters, table and one chair, and the cheapest bed I could find plus a dresser and I had just barely over $500 left. On the money thing, I ended day one with 0 simoleons (as per rules to zero out funds after building). Day 2 ended with a total of 268 simoleons from two of my sims going to work. 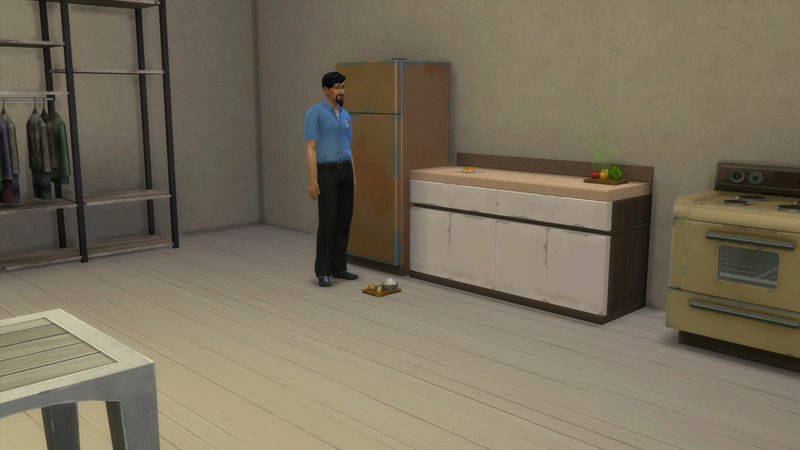 But at the start of day 3 I'm already down to 248 simoleons because of the non-play sims taking stuff out of the fridge to cook and not cooking it and going back into the fridge and getting something else to cook and not cooking it only to grab a bowl of cereal! My math of how much they should of spent on food isn't matching the total household funds, either. So it makes it kinda a hard to determine how much each one has in their own bank when the math just isn't adding up. I wonder if there is some sort of bug where they don't cook stuff on the cheap stove? My sims act like they can't use it. I also think there should be something about collecting stuff. I had a sim go to the park and it has harvest-able plants and they sold for a good amount. Or are they not supposed to travel...lol I need to read the rules again. I have had a long day with the kids. 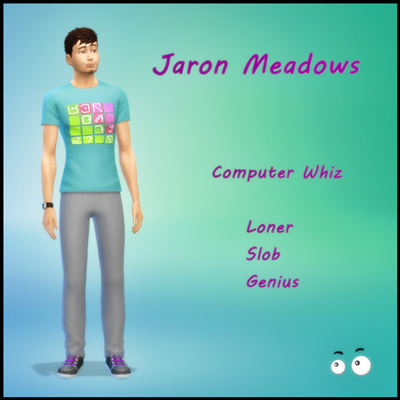 I had my sims travel on the first day to the library in Willow Creek so they would be able to find jobs, seeing how the original rules state no fun or skill items allowed at this point. They can be added later...at least that was my interpretation anyway. I had that issue too with the cheapest stove, then I moved it away from the counter in one home and one of the sims was able to cook. 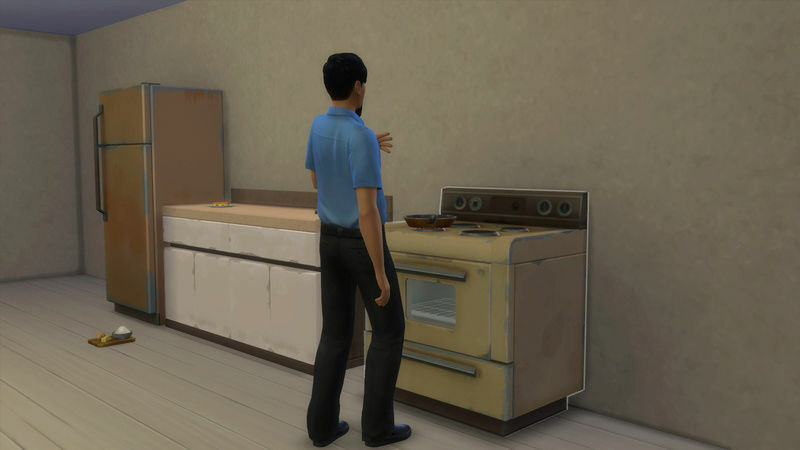 However in another home, the same kind of stove isn't near the counter and my sim would wave and have the footprints with an X in her thought bubble. I've also have not been able to drag dirty dishes to the garbage or adding food to the fridge(don't know if that is allowed or not). Both had that red color when I tried to. My whole (real life) day was rubbish as far as getting time to play. Nothing bad happened just everything kept me from playing. Especially when my cats decided it was a good time to be needy (or is that kneady? ) when ever I opened my game. @Pallystyle tracking the individual income will be a bear and I am thinking that either needs to be optional or just bumped altogether. Have you been bugging my living room? I talk to my Sims like that all the time! I started mine with a common cooking /dining area and only a Fridge and Microwave for food prep. I also have the bookcase in the common area. Travel is allowed and I also and them travel as a group to the library library in Willow Creek. Skill items can be added later as they earn the money to get them. Sunday Day One: Each was given a Diary and instructed to make an entry. Then they traveled as a group to the Library in Willow Creek. Each was instructed to "Read Something"
That was as far as I got before my Shasta (cat) decided he needed to walk across the keyboard multiple times. Pancetta already had the Fabulously Wealthy Aspiration so when they landed on the empty lot the first part to "Have $20,000 in Reserve" was met. That aspiration 'should' help track their earnings for each. I built the house on another lot and kept it under their 22,500 balance until I moved them in. 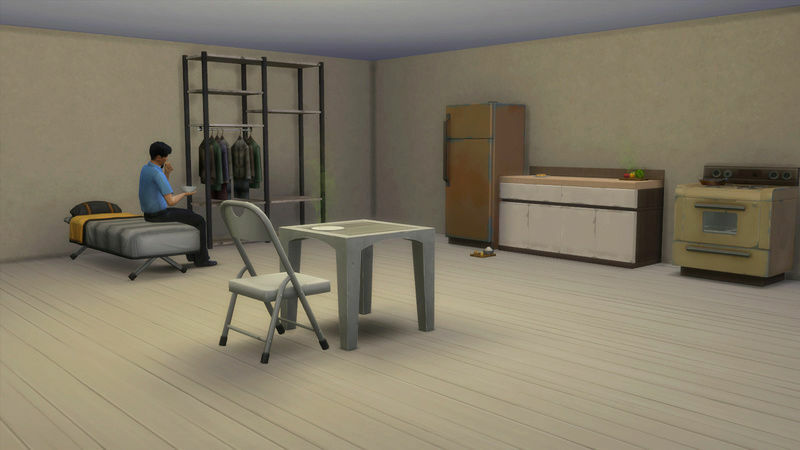 I made one room which included a bathroom and copied it for the other two Sims. Then I gave each room a custom color for each of them. Guests are going to be SoOuttaLuck if they need a bathroom. 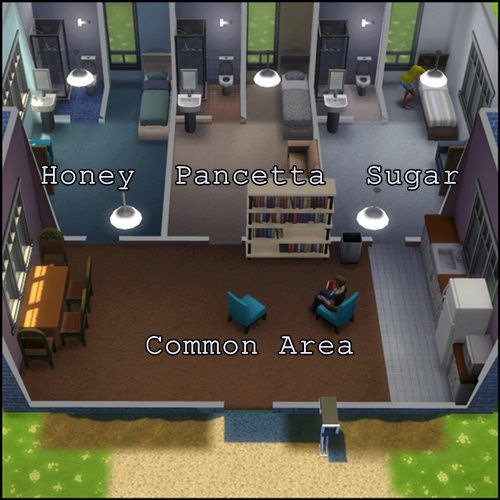 The common area was added last and included counters, a fridge, microwave and sink. They can grill at the park and fix quick or microwave meals until they get some cooking skills. If you are playing now and doing something different please continue. 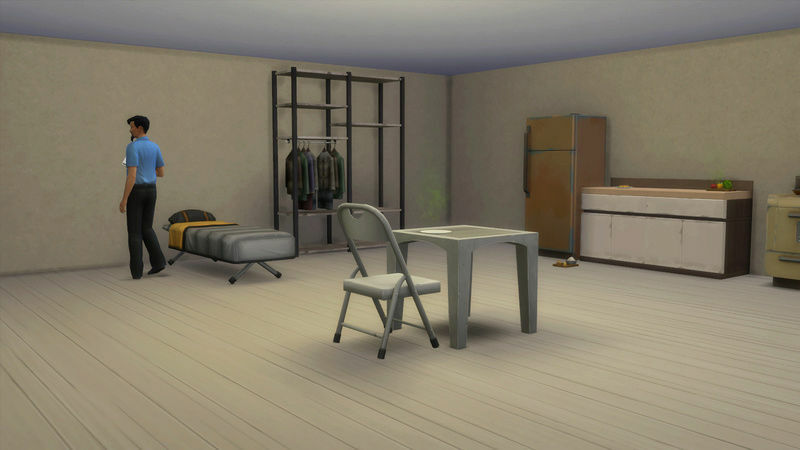 Concept: Three Sims on the same lot with their own living units. Player can control only one of the three on their assigned days. Kind of like the ISBI challenge. Original rules say to play in a 3 day rotation but to make it even (and easier to remember) I am making it two days each for my Test Run. Sunday will be a 'Free Day' to control all three. 1) Create a fresh (not played) household of three Young Adults /Adults in CAS. Looks, traits and Aspirations are up to you. A Random Trait generator can be used if you like. Move them into any lot suitable enough for three different living spaces. 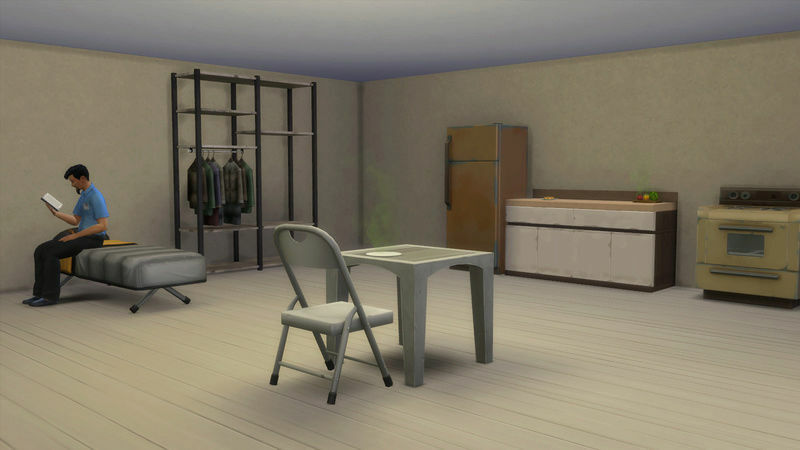 2) Their home lot needs to be within their starting budget and have seating space, bedroom and bathroom for each Sim. The only fun item is a bookcase. No other fun objects or skill builders should be present on the lot. Since books are shared (same books in each bookcase) and same for refrigerators. (Suggestion) I think a common area with one bookcase will work and a common kitchen will work. Don't forget the outdoor trashcan. 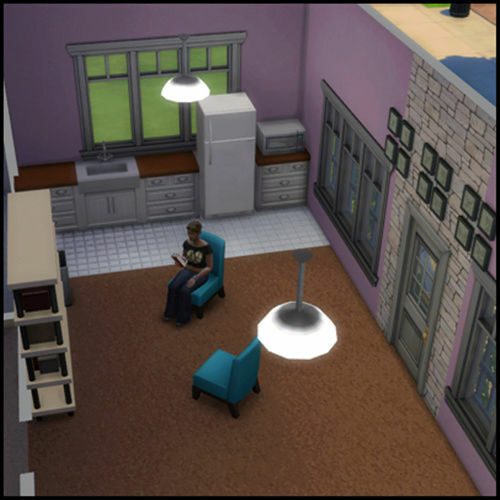 3) Sims moved in and lot is built ... now for the FUN! Set your funds to zero after building the houses. Open the cheat console and type "testingcheats true" (no quotes), hit enter, and then type "money 0" (again, no quotes). Viola! Poor as the poorest church mice. Now the game has an option to lock doors. Lock the doors to only allow the Sim assigned to that space. 4) Sunday - move in day is "Meet & Greet" day and time to set them up with Jobs if you want. Starting the first Monday only Sim 1 can be controlled until it is time for Sim 2 to take over. 1) Each Sim may only be controlled on their assigned day(s). 2) Money tracking hmmm - I would consider this an optional rule. I suppose you could use the Fortune Aspiration to track the earnings of each individual Sim. Or just track the household income and tally up the differences from week to week. 3) Roommates and marriage. Yes you can have more roommates and get married. Children? Sure you can have children if you really want them. Only the original three are controllable. And only the controllable Sim can be directed to care for the child's needs..
4) Travel is allowed either as a group or with the Sim you are controlling that day. 5) You can choose any kind of job / career. -Or- Make money crafting (Painting, Writing or Woodworking) or collecting. 6) *Additional Rules / Guidelines pending testing of the challenge. 2) Each Sim to complete at least one Aspiration. 3) Reach Skill Level 10 of one or more skills. 4) Career Advancement - Highest level achieved. 5) Other goals TBD after testing of the challenge. Challenge ends when all three meet the goals above or they all die. When I played some yesterday I had given them each a 15X15 spot on the biggest lot in new crest. I was going to use the left over area for a common house. Each has a small kitchen, tent, bush and an outdoor shower I put a fence around each section and locked the gate to allow them only. I was not in a building mood yesterday. I like the idea for a communal kitchen. I was having them spend what they made at the end of the day. That way they each use their own money to build up their own house. I'm going to copy down those rules you have so far and try playing some today. I gave them a microwave instead of a stove. I managed to use every penny in building their lot this time. They also have a shared garden area and grill. I hadn't thought of tents either! I like the rules, however, I highly doubt I will have any of my 3 get married or have children. It's hard enough for me to not control the other 2 sims when it's not their assigned day, I think it would prove to be total chaos if I added a wife/husband and children to the mix. @EuphorialQueen, maybe, maybe not on the bug in your living room. 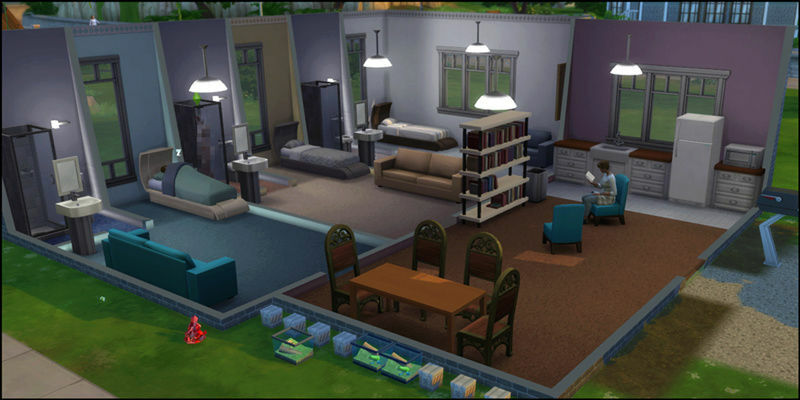 In my game, unfortunately there was not enough money to put any windows on my sims homes and because I do not plan on them actually having a social life which would encourage any of them finding a suitable mate, which then would cause me to go bald and have a complete meltdown, their homes will forever remain the 3 little square boxes I built them and will be updated as needed per their aspirations. Maranda Zuniga. Maranda aspires to be a Master chef which is right in line with her trait, Glutton. She is also a Goof ball and loves Art. Jeffery Dean. Jeffery aspires to be a Body Builder (and does he have the bod to show it!) He is very athletic (you'll catch him doing push-ups and going for jogs frequently), a Bro (a true mans-man) and he has no interest what-so-ever in finding that one and only as he is non-committal. You can follow their challenge here. I am using an older household of mine. Adorable Sims and love the presentation.